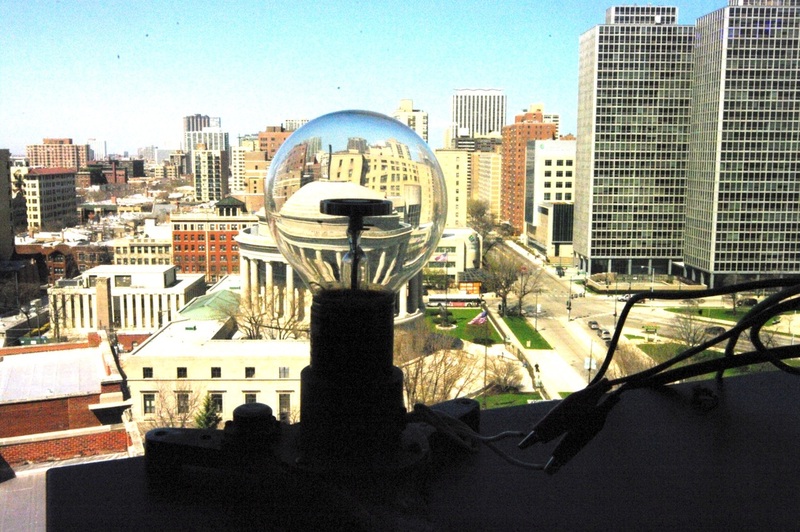 Eppley introduced their pyranometer in 1930, and the Model 50 was used by the US National Weather Service in their solar radiation network from 1951 to 1975. It is a thermopile solar radiation detector with 50 thermojunctions in contact with black and white concentric rings. It puts out a small DC voltage proportional to the incoming radiation intensity. I have two used Eppley Model 50s. One has an original calibration coefficient of 7.75 millivolts per calorie per square centimeter per minute, the other has an original coefficient of 7.30. The photo at the left shows an Eppley pyrheliometer in use at the US Weather Bureau in 1931. 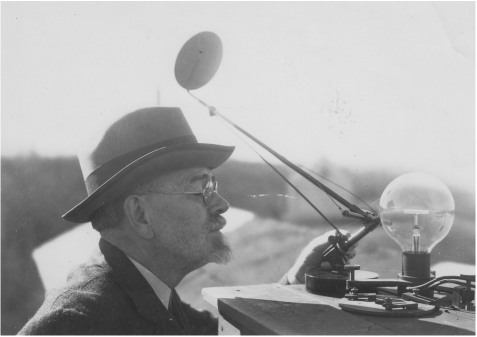 Dr H H Kimball is shielding the pyrheliometer from the direct rays of the sun, presumably to measure the diffuse radiation component of the radiometer reading. I have one of the Model 50s sitting in my window. The unit was really designed for direct solar radiation measurement, but most of the light hitting my unit is diffuse as I have a northern exposure. I measure an output of 0 to 200 microvolts under these diffuse light conditions. During the few hours when direct sunlight from the setting sun comes through my window it reaches 600 microvolts. I measure the Model 50 output voltage with a used General Radio 1807 Microvoltmeter (Not to be confused with the more common Microvolter). Here it is on 1.5 mV full scale. It has an analog recorder output which steps up the microvolts to a few volts, which I then record with an inexpensive USB voltage datalogger (Oops, not analog!). I'm sure the pyrheliometer is out of calibration, but it gives me interesting qualitative results. For example, the diffuse light is often higher on cloudy days than on sunny days. 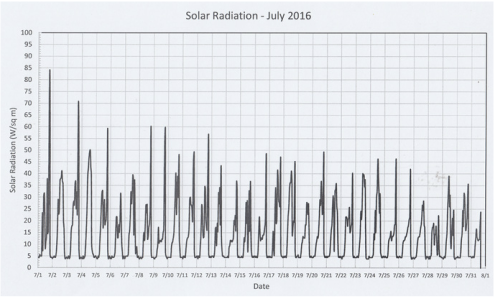 Here's the Eppley pyrheliometer data in watts per square meter for the light coming through my window on an hourly basis for July, 2016.